Organic farm produce has its own special appeal, especially to people who are health-conscious. Such products are not sprayed with poisonous chemicals. They are nourished only with organic fertilizers that are fortified with beneficial microorganisms and enzymes. They are therefore considered safe to eat. And so people are willing to pay a high price for them. In Taiwan, where leisure farms that are visited by thousands of local and foreign tourists are fast increasing in number, organic or natural farming has become the predominant practice. They have good reasons for adopting the technique. Organic farming is not only for the benefit of the consumers, it is also safer for the farmers themselves. Grape farmers around the world, including the few growers in the Philippines, spray a lot of expensive chemicals to protect the plants from diseases. Grapes are particularly susceptible to powdery mildew, a fungal disease, so planters use a lot of fungicide in their farms. Of course, farmers will tell you that fungicides are very expensive. In Taiwan, grape farmers are no exception. Practically every one of them uses fungicide to prevent or control powdery mildew. Except one by the name of Huang Shi Wei, owner of the Naimi Grape Farm in the town of Dachun in Changhua county. 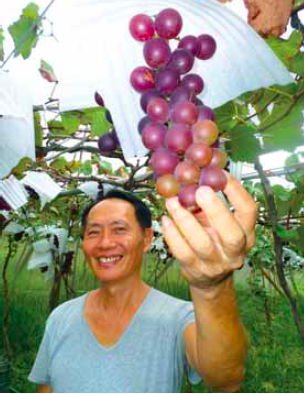 Now 60 years old, Huang has been growing grapes for forty years. And for more than 30 years, he cultured his vineyard the conventional way, using a lot of chemical fertilizers and pesticides. We visited Huang’s grape farm on June 23, 2015, courtesy of the Taiwan Leisure Farms Development Association. And Huang was understandably proud to show us his farm because his is the first and only organic grape farm in Taiwan. After farming the conventional way for more than 30 years, he realized that the practice was endangering his own health. He is also aware that the farm chemicals could contaminate the water underground. Huang said it took him seven years to convert his old farm into an organic farm, and in the process, he did not make any income during those seven years. 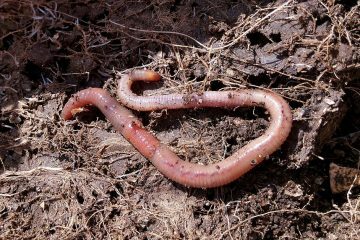 What he did was to apply organic fertilizer, beneficial microbes, and enzymes. He cut the grasses that grew and let them decompose on the spot. Today, Huang is reaping his reward from his organic grape farm. He harvests big fruits that are sweet and juicy. 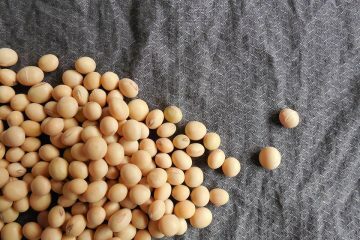 Best of all, they are free of any chemical residue and are therefore very safe to eat. He harvests at least 2,000 kilos from each hectare of his 2.5-hectare farm. And he gets almost four times the price of the conventionally-produced grapes. He exports most of his harvest to Hong Kong and gets NT$ 370 per kilo or about PhP 600 in Philippine money. On the other hand, the conventionally grown grapes fetch only about PhP 160 per kilo. Although he does not use any chemical pesticides, Huang’s vines are healthy and without signs of insect damage. Each bunch of fruits is protected from rain and too much sun with a sheet of durable white paper material. Here’s one good idea that an investor in the highlands, say Benguet, can possibly consider. Perhaps, Gov. Nestor Fongwan, who we know is interested in developing agritourism, would be interested to help. The idea is to put up a leisure farm that grows blueberries as the major crop in combination with some other suitable crops that will make the project economically viable. This idea came to us after visiting the Sheipa Leisure Farm in the Yemakan Mountain in Hsinchu, Taiwan, located literally above the clouds at 1,923 meters above sea level. The farm grows organic blueberries and other exotic fruits like kiwi, cherries, plums, pears, and persimmons. 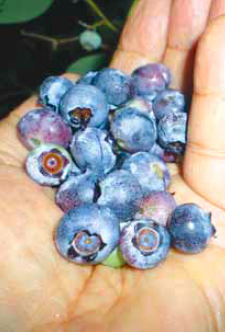 We thought of the idea because several years back, an American agribusiness assistance program had a small blueberry planting trial in Benguet and blueberries did grow and bear fruit that time. However, we have not heard of any commercial planting of the same since then. Sheipa Leisure Farm is a well-developed agritourism destination most famous for its organic blueberries. It is said to be the only commercial blueberry grower in Taiwan. The lure of picking and eating fresh blueberries is attracting many visitors, young and not-so-young, from the local population as well as overseas. Not far from the lodging houses with excellent amenities are greenhouses where blueberries are grown. These are where the visitors experience the joy of picking and eating fresh blueberries that they themselves harvested. Each in-house guest who pays NT$ 3,000 (Php4,800) a night is given three minutes to pick as many berries as he or she can in that short period. Lily Yeh, farm supervisor, says that they can only give that short period to each guest because otherwise, the other guests will not have enough berries to pick. The harvest season is from July to September, although there are some that ripen as early as June. Aside from the three-minute blueberry picking sessions, the guest enjoys breakfast, lunch, dinner, afternoon tea, and a do-it-yourself recreational activity. One DIY that our group enjoyed was making blueberry vinegar after dinner. The vinegar is healthful to drink. Of course, the visitors also enjoy walking on the mountain trail where large cypress and other trees provide an invigorating forest scent. Sheipa Leisure Farm devotes just 7,000 square meters to blueberries. Last year, it harvested 3,000 kilos. Some were sold fresh right on the farm while others were frozen or processed into wine, vinegar, juice, and jam, and used for making cookies and cakes. Fresh berries command a high price. One hundred grams fetches NT$ 130 or Php208 in Philippine money. That’s a whopping Php2,080 per kilo! Blueberry wine is Php960 per 400 ml bottle. Vinegar is Php640 per 400 ml bottle; jam is Php240 per 200 grams and Php480 for 420 grams; and juice, Php608 per 300 grams. The next step for the Filipino entrepreneur would be to look for a source of planting materials. This also means looking for a production technoguide. One should gather as much information as possible about growing blueberries. Experimental plantings could be undertaken by university agronomists as well as well-focused private individuals. Blueberries could be an added attraction to strawberry projects. 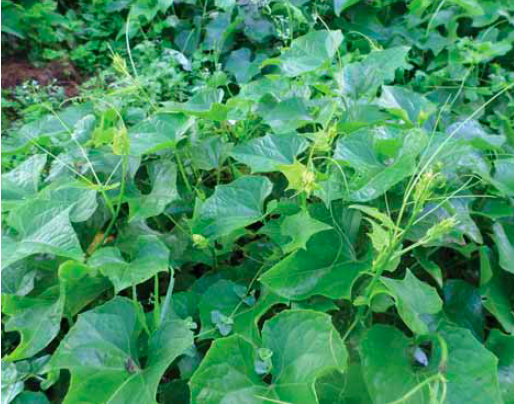 This crop could make agritourism more fun and profitable in the Philippines. All along the footpaths that lead to different sections of the Sheipa Leisure Farm are gorgeous flowering plants in bloom. Two of them were in full bloom at the time of our visit this year. They were very impressive for their floriferousness, size, and brilliant colors. One of them was the hydrangea, better known in the Philippines as Milflores. They are also grown in some parts of the Philippines like in Tagaytay or Baguio but the local versions are small compared to those in Sheipa. want to turn acidic soil into alkaline, you can add lime or ashes so the flowers will become pink. The other flower in abundance in Sheipa is the Agapanthus, which is often called “Lily of the Nile.” Of course, it is not a true lily. It is related to the Amaryllis, which also produces a lot of colorful flowers. 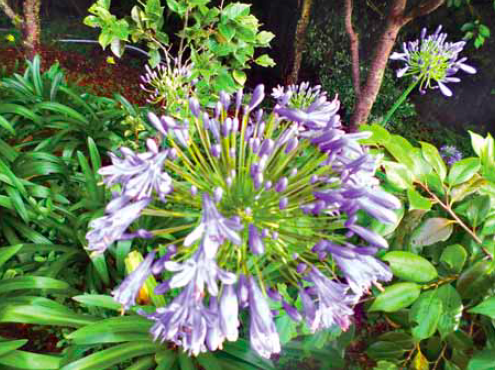 The Agapanthus is a native of South Africa but it will also grow in the cooler parts of the Philippines. The globose flower heads come in two colors. One is blue to violet while the other comes in pure white. For Filipinos who are developing agritourism destinations, it makes sense to include well-maintained flowering plants in the landscape. Agritourists also appreciate beautiful flowers. At the Fairy Lake Leisure Farm in Tainan, Taiwan, they have a way of making old longan trees young again. The technique is called topworking. The technique is not really new in the Philippines. It is mentioned in agronomy courses in college but we have not seen it practiced commercially in this country. In the upland area of Dongshan in Taiwan, longan trees have been growing there for centuries. At the briefing at Fairy Lake, we learned that at least 200 years ago, the migrants from China mainland found longan already growing there. A total of six generations of the Wu family that operates the 52-hectare Fairy Lake Leisure Farm have been devoting 30 hectares to longan, grown the natural farming way. No chemical and processed organic fertilizers are being applied, yet the trees are fruiting profusely year after year, according to Strong Wu, the young, sixth-generation manager of the leisure farm. He said that there must be at least 20 strains of longan in Dongshan, Tainan, and so they selected the most desirable ones. Longan trees can really grow big and tall, making harvesting tedious. So they have been practicing topworking, for which they have become experts. The old trees are cut about two feet above the ground (or thereabouts) and then they graft scions or small branches of selected cultivars onto the stumps. The topworked trees start fruiting in a couple of years and the fruits are very easy to harvest. Strong Wu is very proud of their age-old tradition of processing their longan fruits. They have been drying their fruits the old traditional way, roasting and smoking them in a smoke house for six continuous days, using longan wood as fuel. Strong Wu emphasizes that their old traditional way of drying their longan fruits brings out the best flavor. Dried longan is used in many Chinese food preparations. Longan wood as fuel, you ask? Yes, the wood of the big trees that are topworked are used as fuel for drying the fruits. Three types of dried longan are made. The first kind is with the shell intact. The second has the skin removed but the seed is intact. Then the third is the dehydrated flesh without the seed. Of course, fresh fruits are also sold in the market. Ex-farm, they are sold at only NT$ 40, which is about Php65 in Philippine money. When dehydrated with shell, one kilo fetches about Php200 in Philippine money. Then when it is seedless, the price goes up to the equivalent of Php560 per kilo. Aside from fruits, Fairy Lake derives income from its longan honey. Every year, they harvest about 1,800 kilos of longan-flavored honey which commands a special price in the market. 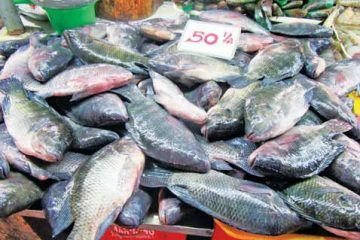 One kilo fetches the equivalent of Php400. Another specialty product is longan tea. Of course, they also make money from agritourists who visit Fairy Lake for a number of reasons. The visitors go there for longan and lychee picking. For an entrance fee, visitors can pick the fruits and eat all they can in the farm The longan-picking season starts in August and will usually last up to October. Visitors will surely love to pick the fruits of the topworked trees which could be just a few feet above the ground. prolific. Many of them are also low-growing because they are also topworked. The tall branches are also cut during harvest time so that new growth that is lower will bear fruit the succeeding year. Picking will then be easier. Lychee fruits at Fairy Lake are plump, juicy, and sweet. They also have small seeds. The harvest season, however, is usually only one month, and that is in the month of June. A special coffee is also produced at Fairy Lake. The variety is called Typica, which is from Ethiopia. It has a nice flavor and is one of the special products of the farm. Roasting and grinding coffee is a do-it-yourself recreational activity that visitors experience during their stay at Fairy Lake. The farm has excellent lodging facilities and a restaurant that serves really fresh organic farm produce. This is what they call Mountain celery at the Long Yun Leisure Farm; it grows like a weed in the forest but makes a delicious dish when stir-fried. Even seasoned politicians will behave like excited little kids when they experience seemingly simple but enjoyable DIY or do-it-yourself recreational activities in leisure farms. 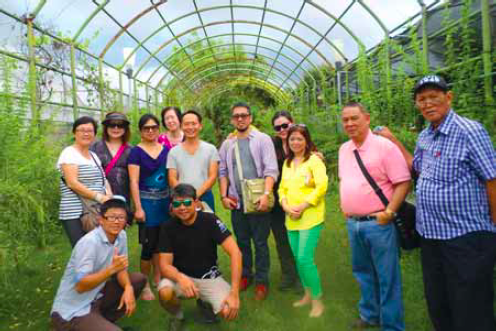 Just like the group headed by Sen. Cynthia Villar that recently went on a mission to Taiwan to observe best practices in agritourism. The group included a congressman, four governors, private entrepreneurs and a number of farmers. One of their stops was the Flying Cow Ranch, where we also happened to be visiting at the same time. After dinner, Sen. Villar’s group of 26 participated in making pudding as the DIY activity that evening. The participants were broken into groups that occupied their own tables. Following instructions from the floor, the groups competed in making what they would call the best-tasting pudding. 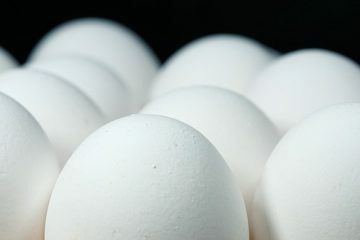 And the politicians were so excited in beating the eggs with much gusto and then combining the same with the other ingredients that included cream, milk, and a little sugar. Then they filled the paper cups for cooking in the oven. It took only a little while for the pudding to be cooked. Each table was given a color code so that when their color is called, they will get their cooked pudding for their eating delight. Of course, all of them claimed their pudding was the best-tasting. It was really fun. We could see that in their smiling faces after partaking of the pudding that they themselves prepared. 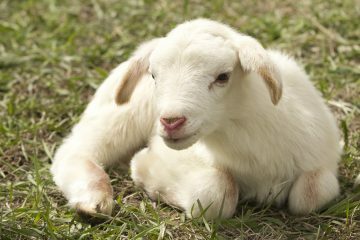 Of course, DIYs are something they realized as fun activities that attract farm tourists. And they were talking of possible DIYs that could be offered by agritourism destinations in the Philippines. In the morning, they walked easily half a kilometer to the milking parlor. Along the way, the tour guide explained what they saw. There were educational postings like a board which illustrated how a cow’s feed goes through its four stomachs. In another posting, there was a comparison of the black and white Holstein Friesian cow and the brown Jersey cow. The Holstein is a bigger animal that gives more milk than the Jersey. On the other hand, the Jersey gives less milk but its milk is richer and better for making cheese. One other recreational activity at the Flying Cow Ranch is exploring the butterfly garden where a lot of flowering plants are grown to attract the butterflies. Among children and adults alike, feeding the Barbados black belly sheep with grass is a favorite. Feeding the ducks and seeing them race from one feeding point to the other is a most entertaining offering at Flying Cow. Then there is ice cream making for both children and adults. Oganic sweet bamboo shoots, tender sayote tops, and refreshing forest air were what impressed us most at the Long Yun Leisure Farm in the Alishan Mountain in Chiayi. One very practical technique for raising native chicken is putting them in an enclosure walled with welded wire. All around the periphery, sayote is planted. One portion is trellised above so that the sayote vines will grow there and serve as shade for the fowls. The rest is open space where the birds can enjoy the sun. The sayote vines grow luxuriantly along the periphery, providing fresh, tender shoots that are stir-fried straight from the garden. More sayote plants are grown in a wide space up in the mountain, together with other vegetables that include cabbage, pepper, and other favorites. Jaden Tan, the owner of Long Yun, has strategically situated his farm beside the 400-hectare national park where towering cypress trees are found. Jaden has rented the place for NT$ 400 per hectare a year so that his visitors can go trekking through the mountain trails and imbibe the fresh mountain air. The group that visited Huang’s organic grape farm: (front row) Leo Fang of TLFDA and Ariel Fernandez; (standing, from left) Jane Chen, Helen Hao, Christine Dayrit, Malou Villanueva, farm owner Huang Shi Wei, Ethelberg Go, Marbee Go, Chona Paredes, Jimmy Cheng and Zac B. Sarian (ZBS). It was great fun viewing Duck Racing at the Greening Ranch in Tainan. A long wooden platform (easily 300 meters long) with seven lanes was built over a body of water. The ducks are swimming in the water but once the signal is made, the ducks go up the platform and race to the other end of the platform, each taking its own lane. The ducks are fed a limited amount at the end and once they are through, they race back to where they started because they know that more feed is awaiting them Each lane is numbered. And when the race starts, the viewers are asked to select the lane where the first duck will arrive. The person or persons to pick the winning lane are given a prize. That time, the winning duck took Lane No.6. No one in our group picked that number but it was fun nevertheless. There are many other recreational activities at Greening Ranch designed for the whole family. There are no lodging facilities for overnight visitors but is a very popular destination for local tourists. No less than 20,000 people visit the place monthly. There you are; it was not only fun visiting the Taiwan Leisure Farms, it was also very educational.